Digital documentation tools – How to use them? Digital documentation tools can be difficult to dissect for a number of reasons. Distributors of digital tools tend prioritise cleaver tech features, which only programmers can operate, forgetting that users need to be able to use the system, without contacting tech support 24/7. Additionally, implementing digital solutions can be a resource heavy undertaking, which require a lot of server capacity, ultimately slowing the potential for fast and easy data collection and -reporting. At Miracle Q-Inspect A/S we strive to make our products as user-friendly and accessible as possible, without compromising on quality and safety. Our QReport software operates with the sole purpose of making inspections and reporting tasks easier and more efficient, adhering to the promise of effective digital documentation. Attached is an infographic showing how to use our QReport software. Enjoy. You can try QReport for free and experience the system and how digital documentation software should function, by clicking the green button in the infographic. Experience an efficient and user-friendly data collection and -processing software that doesn´t compromise on userability, quality or safety. If you’re having difficulties with the system, then we recommend that you watch our tutorial series. Here you’ll learn the basics of QReport, which will provide you with the necessary guidance to eventually master the system. Follow us on LinkedIn and Twitter and be the first to receive updates and content. 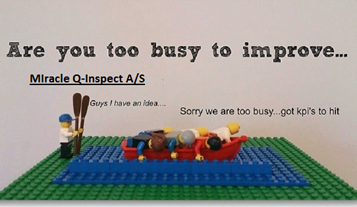 Are you too busy with your KPI’s to optimise?